Alaska is big. It's so big that it's home to two-thirds of America's national park land — that's 84,000 square miles, twice as much land as all the Lower 48 national parks combined. In these vast expanses of wilderness, where there are few trails and even fewer roads, it's still possible to tread where no human footsteps have gone before. "I've wondered that, in a number of these locations, if we were the first ones there," said Pam Sousanes, a scientist studying climate in Alaska's national parks, "and maybe some of the only people that have ever stood on that spot." Each summer, Sousanes and coworker Ken Hill — both of them national park physical scientists — enjoy an unusual ride to work. Today's first stop is a rocky ridge in Gates of the Arctic National Park, a roadless wilderness larger than Massachusetts. 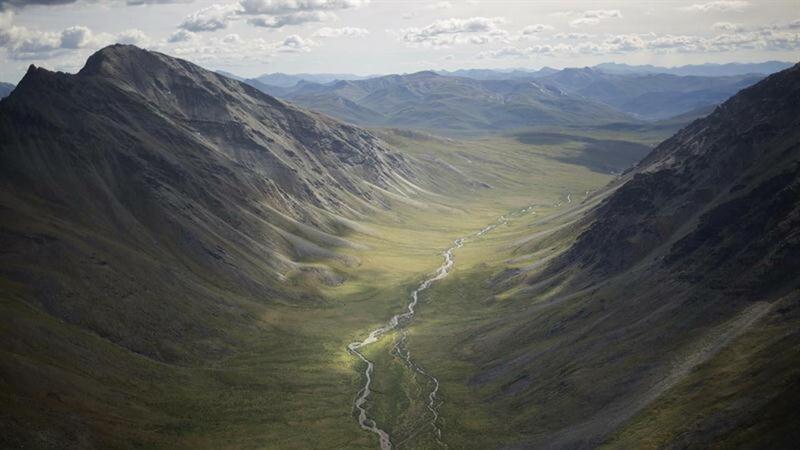 During a 60-mile flight from Bettles (year-round population: 12), their helicopter offers them expansive views of the Brooks Range before settling on a narrow patch of tundra overlooking a U-shaped valley. Hiker On Tundra Near Noatak River In The Brooks Range, Gates Of The Arctic National Park, Northwestern Alaska, Above The Arctic Circle, Arctic Alaska, Summer. Evening light on the mountains surrounding the Noatak River, Gates of the Arctic National Park, Arctic Alaska, USA. Perched here is a metal tripod. Every hour, its instruments record temperature, humidity, wind speed and direction, snow depth, precipitation and other conditions. Sousanes and Hill give it an annual check up —making sure no bears chewed off any parts — and download a year's worth of climate data before boarding the helicopter for the next remote site. The point of this activity is to help park scientists understand what kind of weather precedes a local event such as a big fire season, or a sheep die-off, or permafrost melting. At a larger scale, data from this station combine with other records over the decades to tell bigger stories, for example that 2014 and 2015 were respectively the warmest years on record across the state of Alaska. More than playgrounds for recreational visitors, national parks are also workplaces for scientists. "They're huge laboratories," said Margaret Beer, communication specialist with the park service's Inventory and Monitoring Program. "The science that emanates is significant." To understand the parks better, the park service employs hundreds of scientists with expertise in these fields and more — biology, botany, wildlife, climate, social science, glaciers, caves, geology, ecology, hydrology, geomorphology, acoustics, marine mammals, ocean water quality, epidemiology. Ecologists kayaking the underwater rivers of Mammoth Cave National Park (and other regional cave systems), counting the underground lifeforms that exist there and monitoring their populations against changes in water quality. Field biologists hiking to the alpine lakes of Sequoia, Kings Canyon and Yosemite National Parks to collect water samples and survey amphibian populations. They seek to measure how particles of air pollution—blowing into the lakes from upwind agriculture and industry—affect the water's chemistry and the creatures living there. Marine ecologists scuba diving in Dry Tortugas National Park (and other parks in South Florida and the Caribbean), tracking how populations of globally threatened coral reef species are changing over time. Biologists collaring and observing grizzly bears along the coast of Alaska in Katmai National Park, monitoring their consumption of clams and other invertebrates to understand how threats to the marine environment could affect bear populations. Back in Bettles, Alaska, after a day spent choppering from one rarefied perch to another, Sousanes said she loves her work, both for the spectacular views of her state's national parks and the climate data it yields. "I pretty much know in my heart and my gut that these stations are going to provide very useful information for the next 50 years," she said. "And that's a pretty good feeling, to know you're behind something that's relevant and going to make a difference." Location: Alaska's Brooks Range (America's farthest north national park). Wildlife: Caribou, grizzly bear, Dall's sheep, wolverine, moose, musk ox, arctic terns, arctic ground squirrels, fox. Noteworthy features: North of the Arctic Circle means summer days without sunsets (and long winter nights). Most visitors fly in on small planes. Hiking is challenging with cold river crossings, alder thickets, tussocks and no maintained trails. Winter temperatures reach -50 degrees F.